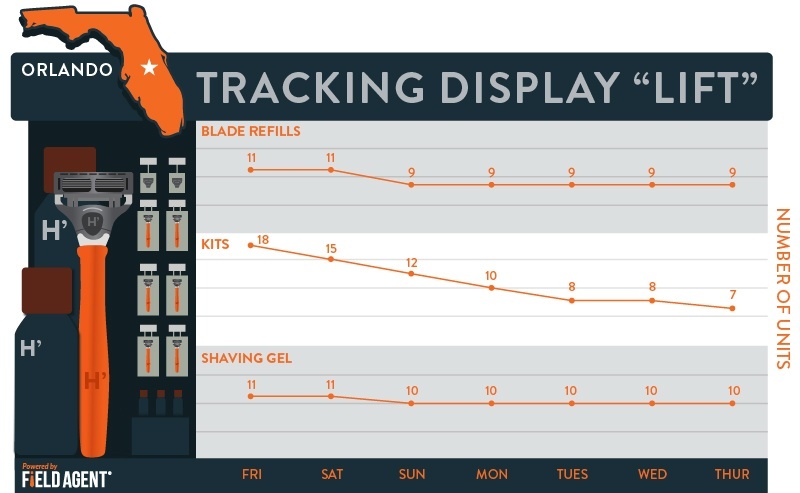 How do we really know our in-store product displays are converting shoppers? After all, barcodes and retail inventory systems don’t tell brands where inside stores shoppers are taking possession of their products, whether through special displays or simply on the main product aisle. It can thus be difficult to know when displays are actually engaging shoppers and closing sales...and when they're not. As this article will demonstrate, Mobile Audits are an effective tool for estimating display turnover (i.e., measuring lift) over time. Armed with such information, brands can make more informed judgments about display investments and performance. 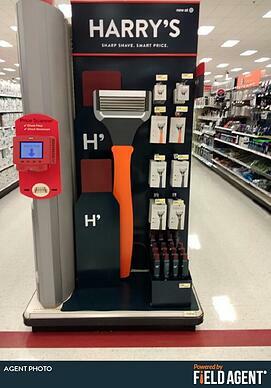 Harry’s—that edgy, online purveyor of razors and razor blades—recently began selling its wares through Target stores across the country. 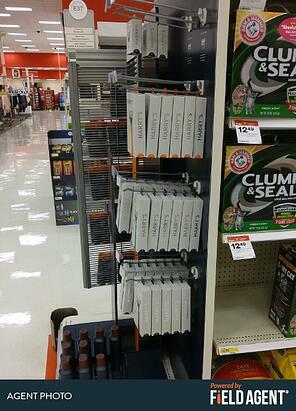 To mark the occasion, the brand set up sleek, progressive-looking endcap displays in Targets nationwide. As you can see from the agent photo, Harry’s devoted less than half the endcap to merchandise. Mobile solutions firm Field Agent randomly selected two of these endcaps (one in Orlando, the other in Dallas) and, over the course of seven straight days (Nov. 4 - Nov. 10), sent Agents to both displays to take pictures and count stock levels. Note: To simplify the results, the graphics below show only one stock count per day. Agents, however, audited the displays every morning and evening. The end result? A rolling picture of stock levels over a week-long period, as well as a quick indication of how well the displays are wooing shoppers. 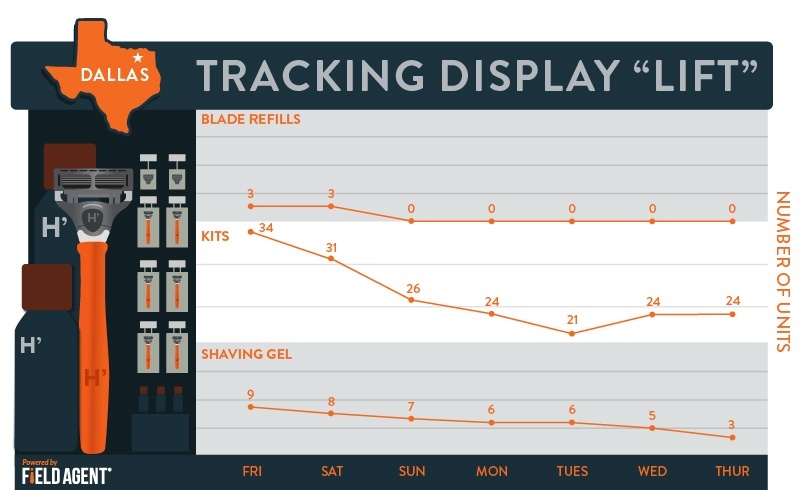 As the graphic above depicts, Agents tracked stock levels for three different Harry’s products: 4-count blade refills, shaving kits (razor plus two blade refills), and foaming shave gel. They also snapped pictures of their assigned displays, so Field Agent could easily verify the accuracy of their counts. Ultimately, Mobile Audits offer an expedient yet reliable means for gauging display turnover, particularly when audits are spread over many stores and displays. They also offer a convenient way to track out of stocks, as you'll now see. A product display is only as good as its replenishment; shoppers can’t buy something that isn’t there. So in conjunction with the Harry’s display audit, Field Agent also monitored out of stocks. Agents were asked to count and report the number of pegs with no available merchandise. The pictures show the high- and low-inventory levels (over the seven-day period) for both the Orlando and Dallas endcaps. The Orlando display began with no OOSs but eventually displayed as many as four OOS pegs. There was never a time when the Dallas display did not have at least one OOS peg, though the number never exceeded two. 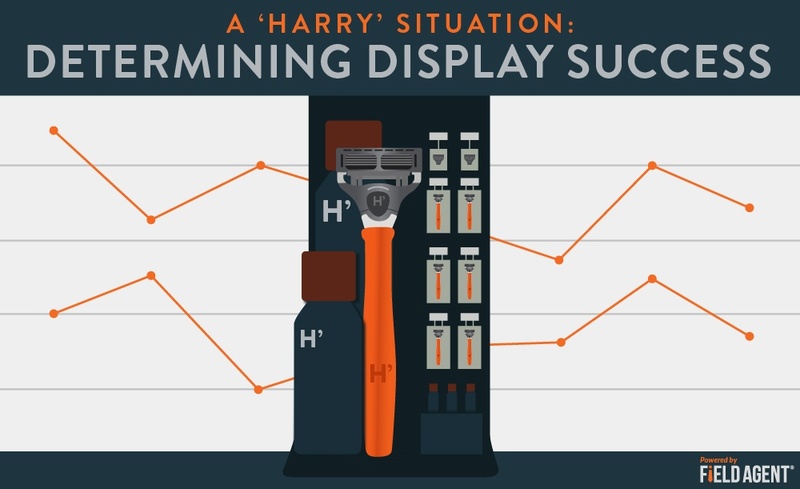 This Harry's example demonstrates just a couple of practical ways Mobile Audits help CPG companies monitor their in-store displays, to provide clarity about display placement, replenishment, and performance. 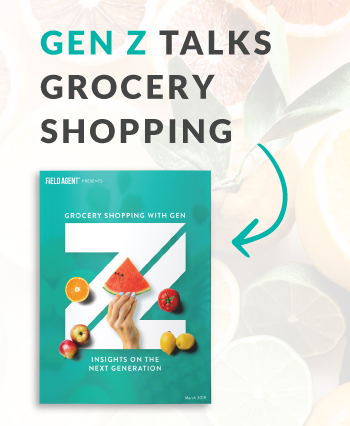 Download the infographic, “Bridging the Knowledge Gap,” to learn more about Mobile Audits and how they put you in control of your in-store marketing.